So you want to be an Artist! YES YOU CAN! Internationally collected Artist Skye Taylor offers one on one straight from the heart encouragement for the beginning or seasoned artist with “Painters block”! Learn how to create your own space and become the best Artist you can be. From time to time we all need a little encouragement and a little helping hand. Here Skye Taylor does just that. He tells us all about his life and how old he was when he first started painting. He goes through the whole process with us. One of the things that you will notice about him is when he talks he appears very genuine and he is someone that you can actually listen to, take in all the info he has given you and put it into practice. He is like a friend when he talks, someone that wants to help you. 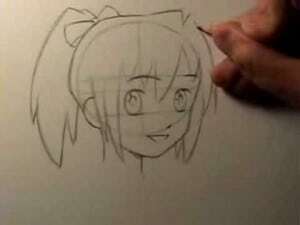 Many art tutorials say all the right things, but it doesn’t really hit the spot. Skye however, gets to the very heart of the matter and gives us his all and years of experience. He teaches us that it is okay to be ourselves and to create what we want. He also explains that sometimes it is fear that gets in the way of our creations. Whether it is a fear to just go ahead and create what we want, or fear that what we create is not successful and we feel a failure. I think the key message is to be comfortable with who you are and do your own thing. If things are forced, the results are not the same. Also try and get into a happy place. Play music or try and set time aside and relax. Don’t rush from one job and then to the next. If you are not feeling in the zone don’t paint until you do. Never worry if you go blank and can’t think of things, go away and come back another day. If you make mistakes who cares, you can always paint over them and start again. So you see you really can’t go wrong and all the help and advise you need is right here in this great advice tutorial. Don’t give up and keep creating. For more information on skye and his work visit http://www.etsy.com/shop/skyetaylorgalleries. Here in this short video, master painter Alan Bell, talks to us from a refuge where he has been helping people to express their inner most feelings and needs through painting for the last 6 years. Often in life we feel trapped and alone and yearn for a way forward that will be a more fulfilling and a happier place. Unfortunately, sometimes in peoples life�s they lose their way due to all different kinds of circumstances. What Alan and the other people at the refuge have tried to do, is to try and encourage people to express their own hurts and feelings on paper, and to also create a new vision of how they would like to see themselves from now on and the new life they would like to lead. Creating a drawing or a painting is not always about doing it for the benefit of others, but can benefit us, by allowing us to explain through pictures our life story which is sometimes very hard and painful to talk about. Projects like this lift the spirit of people who often feel on the outside and give them a focus and something to feel proud of. Many of them make cards or draw pictures for family members and friends and when people praise them for the good work they have done, they are left with a positive feeling and also a smile on their face, which may have not been there for many years. Although many art tutorials teach us about the basics, it can also teach us about people and how we can bring down barriers through education and having compassion for one other despite our different upbringings or believes. I hope you enjoy this video and the very positive message that it also delivers to all of us. Professional watercolor artist Trevor Waugh confidently displays under the guidance of a soothing backing soundtrack how he would take on the complexities of painting white roses. Most people imagine white to be colorless but in actual fact it is anything but that. White is made up of all the colors of the spectrum and with a keen eye any aspiring artist can find these other colors! With a palette of pinks, reds, blues, violets and greens, Waugh uses a a variety of brushes to showcase his techniques and skills. 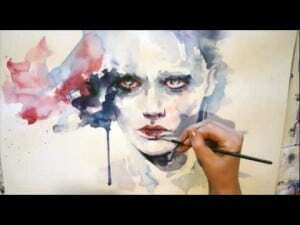 This is a must watch for the aspiring watercolor artist! This is a very interesting way to paint wouldn’t you say? At his workstation an artist has in front of him a large tray of water which is surrounded by various jars of different colored paint/ink. I believe the technique is called�Suminagashi as is the ancient Japanese art of painting with inks onto water to create a marbled pattern in a whole manner of swirls, shapes and colors. The patterns are the result of color floated on either plain water or a viscous solution, and then carefully transferred to an clean absorbent surface, such as fabric or paper. With the right equipment anybody can have a go at this and you can be sure that every painting you do will be different from the last one. This video features watercolor artist John Baxter painting a scene including an estuary, boats, trees and houses. It is a time lapse video which shows how Baxter takes on difficult yet popular themes within watercolor painting. He goes through a whole spectrum of colors and uses many techniques to achieve this very realistic watercolor painting. Fine brushes, large brushes and a variety of washes all constitute this cracking landscape/seascape. Learn from what he has to offer and have a go yourself. In this Indian ink drawing tutorial you will learn through a time lapse video accompanied by real time voice over narrative how to draw trees, grass and clouds using a variety of tips and techniques. The first step is to get a large sheet of cold press watercolor paper which you can find online or in any decent arts and crafts store. This paper should be fully wetted with clean water using a large brush before then being gum taped all the way around the edges. This enables the paper to dry flat, smooth and free from warping and creases and provides an excellent surface for you to commence with your Indian ink painting. This artist explains how in this art tutorial he will be using the ink as a watercolor and offers you great advice on tools to use and techniques to apply to maximise your painting’s full potential. He uses Higgins black Indian ink throughout the demonstration and begins by using a large round sable brush to paint a light wash which is gray in appearance due to its dilution with water. This wash is applied liberally and sporadically and forms the basis of the high and low background clouds and allow the focal point, in this case being the tree, to come forward and stand more prominently within the painting. As a general rule within watercolor painting the higher the clouds are then the darker they should be and vice versa for the lower and more faint clouds. The tree outline is loosely painted with a smaller round sable brush in a light gray again and is reworked with a fountain pen to allow greater detailing and definition to its edges and outlines. A stipple technique is used next when painting the leaves to create a sense of volume rather than meticulously trying to pick out individual leaves which is a sure fire way to over complicate and potential ruin a painting. Once the cluster of leaves have been established you can then use the likes of a small round sable brush to softly blend creating further volume and a sense of depth bring the tree further to the foreground. At this point in the tutorial the artist regresses back to the clouds adding further adding more natural detailing with the ink to the clouds and surrounding areas to further emphasise the impression of realism. The grass mound where the tree is situated is painted using a sable fan brush but as with the leaves he uses a stippling technique to highlight and give the impression of certain areas rather than trying to tackle each individual blade of grass. It is because of the shape and style of this fan brush which makes this an invaluable tool for the type of ink painting. Sable brushes are more valuable to use with inks than their counterpart synthetic versions due to their ability to hold in a lot more ink meaning less trips to ink pot and more concentration on the painting itself. This video is very thorough and ideal for the beginner inks and watercolor painter and harbours some great tips and techniques for you to further your paintings and learn how to use Indian ink. From this online art tutorial you will discover a great watercolor lesson on how to paint a wolf with professional artist and wolf lover Jody Bergsma. She introduces the watercolor paints she normally uses and they are yellow, sepia, burnt sienna, serellium blue and cobalt blue. Jody Bergsma works from a reference photo which she took at some point but also mentions that it is important and extremely handy to have a collection of other reference photos or drawings as they hold many colors, shades and textures ready for quick referencing. She lays out her palette in a rainbow sequence going from light to dark but also has her reference photo next to the palette as a visual aid to premix her watercolors and appoint them to specific areas of the photo. She mixes the mineral blues with the sepia to form complimentary shadow tones which will be uses a lot when painting the wolf. The sepia and the sienna are mixed to create a terrific brown which will act as a primary shade for some of the areas of fur. A perspex palette and a medium flat brush is used to mix ready for the painting. She specifies how you should keep your washes separated as there will be a tendency to run. The mineral paints will not bleed so when you get to the stage of shadowing it will be much easier than the initial wash stage and will also be a turned point where more interest is brought to your painting with a more three dimensional and life-like appearance. Throughout the several stages of the painting Bergsma gives hints and tips offering valuable information needed to paint your wolf to your best ability. There are mentions of glazing techniques and knowing how to control your glaze lines as well as offering drying times. Shadowing and highlights are also important stages in this painting so with your watercolor brush go careful with over applying the paynes gray which is heavily used throughout the tutorial. This art video is not only an excellent video to learn to paint from, but also offers small historical snippets of the wolf’s heritage throughout. This is an ideal video for beginner artists looking to learn more about watercolor and animal drawing. This video shows Trevor Waugh doing what he does best in watercolor painting- …florals. With an entertaining and energetic approach Waugh deliberately and structurally takes to the paper with a variety of brushes to come to an eventual unveiling of a classic floral painting. This video tutorial is accompanied by an original soundtrack also composed by the artist Trevor Waugh, and creates a very relaxing painting experience. Follow his techniques and you won’t go far wrong. Pay attention to his color choices and in which order the watercolors are applied. Beautiful stuff. Born in the French capital in 1942, artist and illustrator Francine Van Hove (born Van Nieuwenhove) completed her studies at the Lyc�e Claude Bernard in 1963. She had her first taste of public recognition with her first exhibition in 1971. She paints gentle, sensuous portraits of women in day-to-day poses. She always paints with a live model and has a particular mastery of transparent skin tones. Beauty, refinement, sensuality and meditation are the prominent themes of her work. She is inspired by daily life, painting and literature. Enjoy this video montage made up of her paintings accompanied by the song �I want love� by Elton John. © 2017 ArtisanHQ. All Rights Reserved.